The Video Below shows a few moments of the crowds at Naperville, Illinois’, Ribfest on July 4, 2014, and some of the fireworks which followed. I did the video so that at the end I could put a few seconds of a song that was not played. For the first time in years—maybe decades—Ray Charles’ iconic version of “America the Beautiful” wasn’t played on the radio stream synched with the fireworks. The song usually accompanied slower, more reflective seconds of the show sandwiched between the general bombast, but this year it was all uptempo—Van Halen’s “Jump,” etc, lyrics like “Do a little dance, make a little love, get down tonight,” etc. Not entirely inappropriate, but we wished for something a little deeper, a nod to America beyond, say, Tom Petty’s “American Girl.” A new radio station streamed the accompanying music this year. ”It’s probably a Clear Channel station out of New York,” a friend and music insider I was with said after shaking his head at the exclusion of the Ray Charles classic. ”They don’t know tradition. They do anything silly thing they want,” he lamented. There are several patriotic songs I can do without, but Charles’ version of “America” isn’t one of them. Whenever the song is played now, nine times out of ten it’s his version. 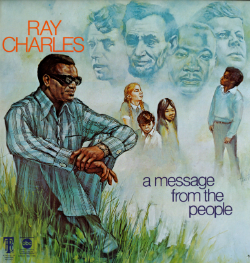 It ended Charles’ significant 1972 album A Message from the People. He begins his version not with the song’s first verse, but its second: “Oh, Beautiful, for heroes proved / In liberating strife, / Who more than self their country loved, / And mercy more than life.” For several reasons—including the album’s cover pictured above—we know that those heroes he wanted to honor foremost were the heroes of the Civil Rights Movement. This year marks the 50th Anniversary of the landmark Civil Rights Act, so we missed Ray Charles’ “America” at least twice as much this time. Soon I’ll post something about that anniversary, as well as reviews of his albums The Genius Hits the Road and A Message from the People. I’ve already begun posting a long, 5-part Video Series on Ray Charles and a post indexing All Things Ray on this site. 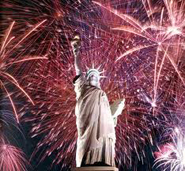 But for now enjoy the 4th of July and the few seconds of “America” I sneak in at the end attempting to redeem some programmer’s musical miscue. This entry was posted in Music & Media Podcasts, Social Change and tagged "America the Beautiful", 50th Anniversary of Civil Rights Act, A Message from the People, Civil Rights Movement, Naperville Rib Fest, Ray Charles. Bookmark the permalink.